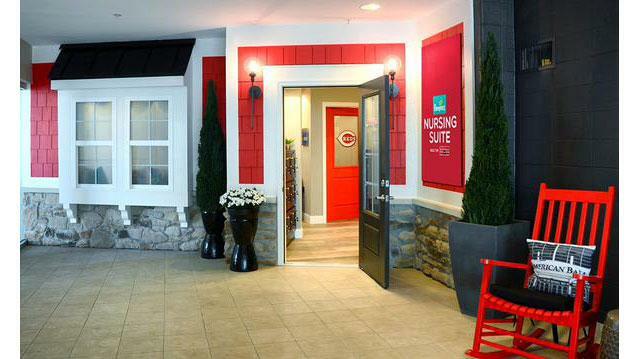 Great American Ball Park home of Major League Baseball Cincinnati Reds offer a top notch nursing mothers lounge for visiting oms. The room has five padded rocker gliders for nursing moms who are breastfeeding or breast pumping. The suite also contain private restrooms, a kitchenette with a refrigerator to keep express milk fresh, and lockers to store other items during games. The suite also has flat screen TV's so moms can watch the game while they breastfeed or pump. There are also toys to keep todlers occupied while their moms breastfeed or pump.